AFL-CIO: Job Safety - This AFL-CIO job safety and health website is designed to help all workers learn about their rights, to provide the latest job safety and health information and resources to union and nonunion workers, local union safety representatives and job safety and health professionals. American Industrial Hygiene Association (AIHA) - One of the largest international associations serving the needs of occupational and environmental health professionals practicing industrial hygiene in industry, government, labor, academic institutions, and independent organizations. American Journal of Industrial Medicine - Original research, review articles, instructive case reports, and analyses of policy in the fields of occupational and environmental health and safety. CalOSHA - California's Occupational Safety and Health Agency home page. Also see, California Code of Regulations Title 8, Databases (providing licensing, registration and certification inormaiton and prevailing wage information), and the California Labor Code. Cal-OSHA Reporter - Weekly newsletter providing coverage of coverage of occupational health and safety. Information on new laws, rules, regulations, requirements and decisions. Canadian Centre for Occupational Health and Safety (CCOHS) - Promotes a safe and healthy working environment by providing information and advice about occupational health and safety: Biological Hazards, Chemical and Materials, Diseases, Disorders and Injuries, Ergonomics/Human Factors, Health and Safety Programs, Information Resources/Referrals, Legislation, Occupations and Workplaces, Physical Agents, Prevention/Control of Hazards, Psychosocial Issues, Safety, Workplace Schedules. Center to Protect Workers' Rights (CPWR) - Focuses on safety and health in construction and related economics issues. CPWR is the research and development institute of the Building and Construction Trades Department, AFL-CIO. Chemical Injury Information Network (CIIN) - Support and advocacy organization run by the chemically injured for the benefit of the chemically injured. It focuses primarily on education, credible research into Multiple Chemical Sensitivities (MCS), and the empowerment of the chemically injured. ChemSafety.gov - U.S. Chemical Safety and Hazard Investigation Board site. Promote the prevention of major chemical accidents at fixed facilities. Electronic Library of Construction Occupational Safety and Health (eLCOSH) - A collection of information on construction safety and health developed by the Center to Protect Workers' Rights with funding by NIOSH. Environmental Protection Agency (EPA) - EPA's mandate includes preventing pollution and reducing risk in communities, homes, workplaces, and ecosystems. The EPA site is filled with environmental information, resources, and data. European Agency for Safety and Health at Work - Network of more than 30 occupational safety and health (OSH) websites providing access to key issues such as legislation and regulation, good safety and health practice, research, statistics and publications. FairWarning - Public interest journalism on issues of health, safety and corporate conduct. Fatal Injuries to Civilian Workers in the U.S., 1980-1995 - Statistics on over 93,000 deaths are provided by demographic and injury characteristics. These data may be used for developing prevention strategies by enabling researchers and practitioners in government, academia, industry, and labor to focus efforts on the leading causes of workplace injury death in the high-risk industries and occupations. Published by the CDC's National Institute for Occupational Safety and Health (NIOSH). 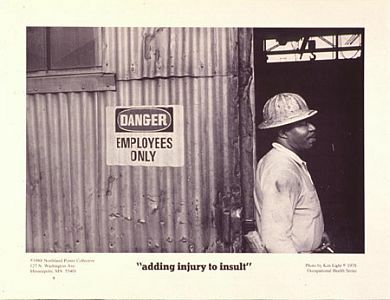 Federal, State, and OSHA Posters - This site provides all-in-one labor law posters for employers. Employers must post and maintain labor law posters to inform their employee's of their rights. HazardEx - Provides up-to-date information specifically relevant to those companies and individuals responsible or interested in safe working operations within hazardous area environments. Health & Safety Executive (HSE) - The HSE responsible for the regulation of almost all the risks to health and safety arising from work activity in Britain. Health Benefits Advisor - From the U.S. Department of Labor. designed to help workers and their families better understand employer and employee organization (such as a union) provided group health benefits and the laws that govern them, especially when they experience changes in their life and work situations - such as marriage, childbirth, job loss or retirement. Health Research Group - Promotes research-based, system-wide changes in health care policy as well as providing advice and oversight concerning drugs, medical devices, doctors and hospitals and occupational health. IARC Monographs - The IARC Monographs series publishes authoritative independent assessments by international experts of the carcinogenic risks posed to humans by a variety of agents, mixtures and exposures. Injured Workers 4 Change - Shedding sunlight on the nationwide abuse, medical fraud, and vicious unlawful retaliations instigated against America's injured workers under State Workers Compensation Systems. Injuries, Illnesses and Fatalities - From the Bureau of Labor Statistics (BLS). International Occupational Safety and Health Information Centre (CIS) - CIS is the knowledge management arm of the Programme on Safety and Health at Work and the Environment (SafeWork). Its goal is to ensure that workers and everyone concerned with their protection have access to the facts they need to prevent occupational injuries and diseases. CIS continuously monitors world literature on occupational safety and health through its contacts with publishers and with 140 focal points (CIS Centres) at the national or regional level. Summaries and citations of the most useful publications, as well as products based on the collected information, are disseminated electronically and in print. The network of CIS Centres contributes to the exchange of information among persons responsible for the establishment and implementation of national policies and programmes. International Programme on Chemical Safety (IPCS) - A joint programme of three cooperating organizations - WHO, ILO and UNEP, implementing activities related to chemical safety. WHO is the Executing Agency of the IPCS, whose main roles are to establish the scientific basis for safe use of chemicals, and to strengthen national capabilities and capacities for chemical safety. Job Safety - Presented by the AFL-CIO. MEDLINE via PaperChase - MEDLINE and OLDMEDLINE are combined. You search all five databases at once, a total of more than 15,000,000 references to biomedical literature. MEDLINEplus Health Information - Up-to-date, quality health care information from the world's largest medical library, the National Library of Medicine at the National Institutes of Health. Medscape - Medscape is built around practice-oriented content. Each specialty site pools, filters, and delivers continually updated content from thousands of medical journal articles, expert-authored surveys in disease management, summaries from medical meetings, and more. Multiple Chemical Sensitivity (MCS) Interagency Workgroup - A 1998 report on MCS containing information and resources on the topic. National Center for Farmworker Health (NCFH) - Promotes consideration of farmworker needs in larger policy discussions by educating the general public, organizations, and policy makers about farmworker issues. National Institute for Occupational Safety and Health (NIOSH) - Part of the Centers for Disease Control and Prevention (CDC) and the only federal institute responsible for conducting research and making recommendations for the prevention of work-related illnesses and injuries. National Institute for Occupational Safety and Health (NIOSH): Pocket Guide to Hazardous Chemicals - General industrial hygiene information for workers, employers, and occupational health professionals. Presents key information and data in abbreviated tabular form for 677 chemicals or substance groupings (e.g., manganese compounds, tellurium compounds, inorganic tin compounds, etc.) that are found in the work environment. National Safety Council (NSC) - Dedicated to improving the safety, health and environmental well-being of all people. The Council started in the workplace - in factories, warehouses, construction sites - making businesses aware of ways to prevent unintentional injuries on the job. Subsequently, its efforts were expanded to include highway, community and recreation safety; and its mission now encompasses all major causes of preventable injuries and deaths, including occupational and environmental health and general wellness. New York Committee for Occupational Safety and Health (NYCOSH) - News and information about on-the-job safety and health. NICAR Database Library - A list of databases available for purchase through NICAR. The link to each leads to a description of the database. For each database, a record layout is available, as well as code sheets, when they are required. You can also download a 100-record data sample from each database. NIOSH Pocket Guide to Chemical Hazards - A source of general industrial hygiene information on several hundred chemicals/classes for workers, employers, and occupational health professionals. The NPG does not contain an analysis of all pertinent data, rather it presents key information and data in abbreviated or tabular form for chemicals or substance groupings (e.g. cyanides, fluorides, manganese compounds) that are found in the work environment. The information found in the NPG should help users recognize and control occupational chemical hazards. Non-Ionizing Radiation: Extremely Low Frequency Fields - Extremely low frequency (ELF) fields includes alternating current (AC) fields and other electromagnetic, non-ionizing radiation from 1 Hz to 300 Hz. ELF fields at 60 Hz are produced by power lines, electrical wiring, and electrical equipment. Current research has focused on potential health effects of magnetic fields because some epidemiological studies have suggested increased cancer risk associated with estimates of magnetic field exposure. Exposure to ELFs depends on the strength of the ELF fields at the source, the distance from the source, and the duration of exposure. Occupational and Environmental Medicine (OEM) WWW Resource Index - External links from the OEM/Duke University pages, mostly selected to take readers to the actual agency involved. Emphasis is on sites where the information available goes beyond the institutional biography of the sponsor. Occupational Health & Safety (OHS) - Industry-leading occupational health and safety news magazine. Occupational Medicine Practice Guidelines: Evaluation and Management of Common Health Problems and Functional Recovery in Workers - ACOEM's Guidelines are the gold standard in effective treatment of occupational injuries and illnesses. They are intended to help improve or restore the health of those workers who incur occupationally related illnesses or injuries. ACOEM's are the only evidence-based guidelines that focus on returning employees to work within 90 days of an injury or illness. (This is clinically appropriate, as data show that more than 90 percent of workplace injuries are resolved within this time period.) The Guidelines were developed in response to rising expectations for quality of care; increased expectations for good outcomes and medical safety; the need to stop over utilization and to curb unproductive and even harmful procedures; and the need to reflect advances in medicine based on the best available evidence. The Guidelines - which were developed, tested, and refined in medical practice - present essential evidence-based information to address the injured worker's functional impairment and safely return him or her to work. The treatment approach takes a comprehensive view that encompasses the medical, psychosocial, and functional outcomes of the injured worker. This approach enables the Guidelines to be an integral, seamless part of treatment planning and case-management systems. The Guidelines are an important tool for physicians and other health care providers, and all others with responsibility for or involvement in worker health and workers' compensation systems. Occupational Safety and Health Review Commission (OSHRC), an independent agency to adjudicate enforcement actions challenged by employers. OSHA Data and Statistics - Find a company's OSHA inspection history, including a listing of violations and fines. OSHA Fatality Inspection Data - Provides data on work-related fatalities for cases in which the employer was issued a citation by Federal OSHA where at least one violation was related to the fatality. This is a conscious decision made by the Trump administration to bury the real numbers of workers that are getting killed on the job. Previous listings included fatal incidents that were outside federal OSHA jurisdiction, not work-related, and/or in which the employer was not cited for a violation related to the incident. Also removed from the list are the names of victims. Instead, the list now provides only the date, location and a brief description of the incident. To see where the victims worked, the public must click through to incident reports. Detailed information on some additional cases is available by searching summaries of fatality and catastrophe investigations, although locating the information on the website can be difficult. OSHA Report a Fatality or Severe Injury - Instructions on reporting a fatality or severe injury. Occupational Safety and Health Administration (OSHA): Ergonomics - This site contains complete regulatory information, compliance assistance, and other related materials. Occupational Safety and Health Administration (OSHA): Technical Links to Safety and Health Topics - Site links to compliance, technical, and training information. Occupational safety and health information categorized by 100+ technical subjects. Pages about hazards describe ways to recognize, evaluate and control the hazard. Pages about industries describe the hazards in the industry and how to control them. Provides a variety of reference materials including OSHA and non-OSHA documents, training slides, course handouts, video clips, and links to other Internet sites. Occupational Safety and Health Review Commission (OSHRC) - An independent Federal agency created to decide contests of citations or penalties resulting from OSHA inspections of American work places. OSH - Internet gateway site for occupational safety and health information and resources. The site has over 1,300 annotated links to interesting Internet sites containing a vast amount of information on health and safety. Osh.Net is owned and published on a for-profit basis by WorkCare; an occupational health consulting and outsourcing firm. OSHA Establishment Search - This page enables the user to search for OSHA enforcement inspections by the name of the establishment. Information may also be obtained for a specified inspection or inspections within a specified SIC. OSHA Safety Regulations & Labor Law Guide - Information on Federal, State, and OSHA regulations. OSHA Statistics and Data - Specific injury and illness and inspection data. OSHA Whisteleblower Protection Program - Enforces the whistleblower provisions of more than twenty whistleblower statutes protecting employees who report violations of various workplace safety, airline, commercial motor carrier, consumer product, environmental, financial reform, food safety, health insurance reform, motor vehicle safety, nuclear, pipeline, public transportation agency, railroad, maritime, and securities laws. Rights afforded by these whistleblower acts include, but are not limited to, worker participation in safety and health activities, reporting a work related injury, illness or fatality, or reporting a violation of the statutes. PubMed - Comprises more than 20 million citations for biomedical literature from MEDLINE, life science journals, and online books. Citations may include links to full-text content from PubMed Central and publisher web sites. Quarterly Workforce Indicators (QWI) - U.S. Census Bureau's QWI measures performance of local economies - where jobs are, for what kind of workers, how much workers can expect to make and employers expect to pay them. RES Training - Provides environmental health and safety training courses including OSHA 10/30-hour Outreach courses, Hazwoper training, Confined Space training, Forklift and DOT training. These are interactive courses which meet OSHA guidelines and regulatory requirements. Resources for Workplace Safety and Health - Electronic access to more than 700 titles: workplace safety and health training tools including course materials, informative brochures, topical outlines, reports, checklists, and more. Most of the documents in the original collection were developed through grants from the Hazard Abatement Board administered by the New York State Department of Labor. Safety Online - Information about occupational safety and health and the business of safety. The site provides comprehensive regulatory, program management, technical, association, and product and services information, as well as a thorough industry directory. Daily news updates and business reports cover industry trends, compliance, injury/accident reduction, loss prevention, accident investigation, proper use of personal protective equipment and much more. SafeWork - ILO resources on saftey and health at work. Social Accountability International (SAI) - A non-governmental, multi-stakeholder organization whose mission is to advance the human rights of workers around the world. It partners to advance the human rights of workers and to eliminate sweatshops by promoting ethical working conditions, labor rights, corporate social responsibility and social dialogue. The SA8000 standard is the central document of the work performed at SAI. It is one of the world's first auditable social certification standards for decent workplaces, across all industrial sectors. Typing Injury FAQ - Wide variety of information about repetitive strain injuries (RSIs), resources for dealing with these ailments, and a broad description of assistive products to reduce injury risk and symptoms. Bureau of Labor Statistics: Census of Fatal Occupational Injuries (CFOI) - Worker fatalities data. U.S. Chemical Safety and Hazard Investigation Board (CSB) - Promotes the prevention of major chemical accidents at fixed facilities. What is FELA? - The Federal Employer's Liability Act (F.E.L.A.) was enacted by Congress in 1908 to provide benefits for railroad workers who sustain injuries in the scope of their employment. FELA, or the Federal Employers Liability Act, gives railroad workers not covered by regular workers' compensation laws the right to sue their employers for damages if injured while on the job. Under FELA, workers have been allowed monetary payouts for pain and suffering by allowing a jury to determine awards based on comparative negligence. Congress passed FELA in response to the thousands of deaths and injuries in the late 1800s and early 1900s, and since then, the industry has been unable to reform the law. Workers Health and Safety Center - Worker-driven health and safety delivery organization in Ontario, Canada. Its operations are overseen by an independent board of directors from unions and other organizations representing workers in virtually every sector of the Canadian economy. WORKSAFE - A California coalition for worker occupational safety and health protection. The coalition includes labor and community groups as well as individual workers, occupational safety and health and other professionals, environmentalists, and other interested persons. Workplace Safety & Health - Asbestos, chemical safety, construction, mining, office environments, respirators and more. From the CDC. This webpage last updated on Sunday, September 10, 2017 11:42 AM.